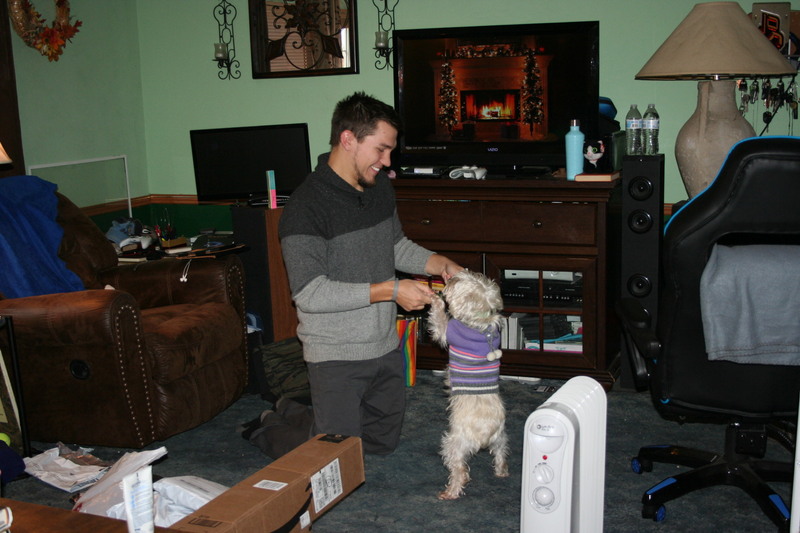 One day that Sean was working at home, he, Tiffany and I began wrapping Christmas presents. Dollar Tree had some fun wrapping paper. I especially liked the Nintendo Mario themed and Minions papers. I got a good start on it but lots to go. We put Christmas music on and just went with it. Do you know that there is a right tape for a type of paper? 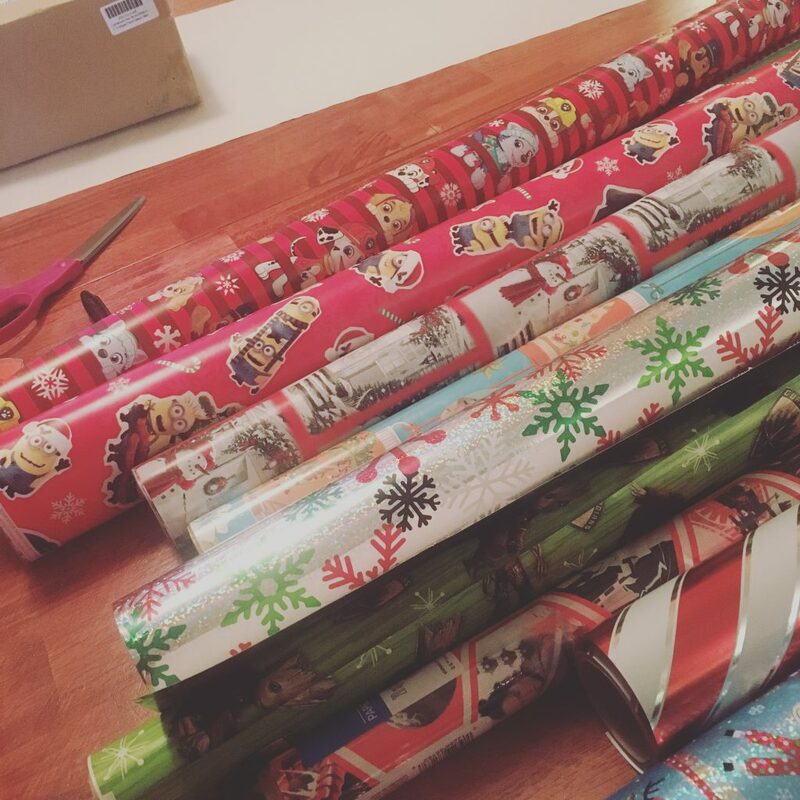 If you buy foil wrapping paper, do yourself a favor and get regular tape. It is a bit shiny and will hide on the foil paper nicely. But if you have the standard paper finish, which I think is more of a matte finish, then that is when you want to use the invisible tape. However, if you try to use the invisible tape on foil paper, it will not be invisible; it will kind of be like a ghost and foggy. On Monday this week, it snowed! It was a lovely snow! 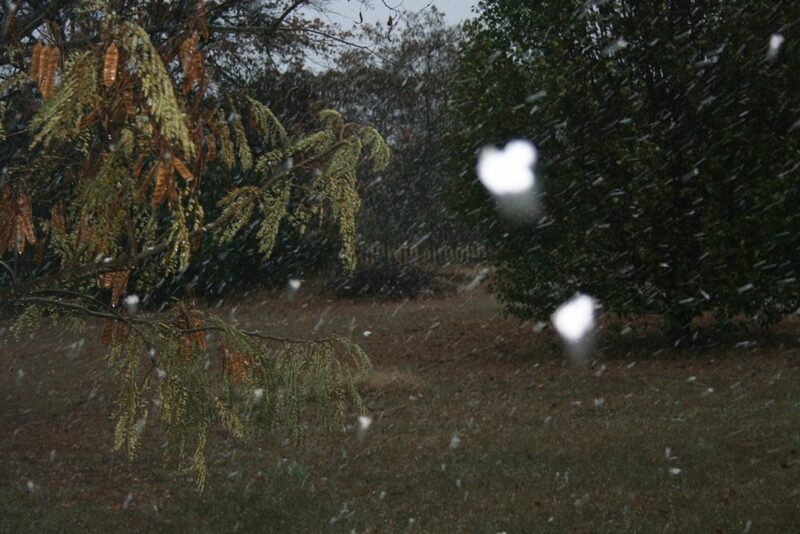 We didn’t get a whole lot of accumulation but it was really pretty. 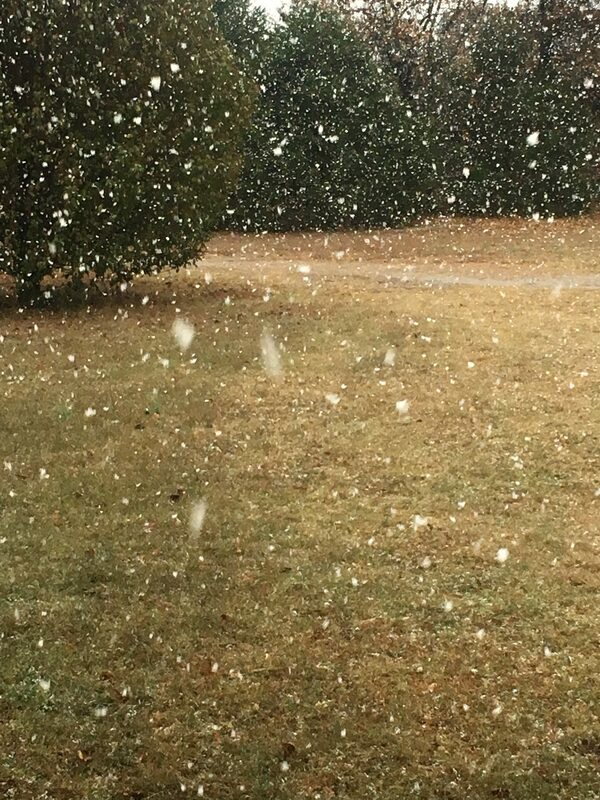 I took this picture shortly after it had begun and the flakes were really big. Yes, they got as big as cotton balls! It was gorgeous! It was beautiful and then it was gone. We got around an inch or so and then the temperature rose and it melted. That’s why I like snow here; it snows and disappears before it can turn into a dirty mess. I’ve been working on getting all my gifts bought. I still have a few stragglers to pick up but I’m nearly finished. Other than buying gifts and getting them wrapped, not a whole lot has been going on. I did make a two week menu this week so that I don’t have to shop next week. I got a couple of turkeys on sale the other week and will have that and planned-overs most of the following week. Did I mention that Michael’s has some really cute washi tape for just 33¢ a roll? Yep! You get to pick the ones you want too! It’s awesome! I may have gotten a little carried away. I have several different sets of washi tape on my Christmas list. I picked some I liked while I was with Tiffany. And I picked some while I was with Tracie. Washi Tape heaven. Mom mentioned when we were out the other week that she’d like to see what I use the washi tape for. So Sunday I took my bullet journal and showed her. It’s funny because in the beginning there was NO washi tape. Then you could see where I’d gotten a few rolls. Then it was quite clear when I’d gotten some for my birthday. I like to have some nice glittery rolls both with designs and just glitter and in varying widths. Then I like to have some tapes with nice seasonal designs and other designs as well. I also like foil tapes. But one mustn’t overlook the value of plain tapes. I’m looking forward to starting a new bullet journal next year with such a wide variety of washi tapes and stickers. I was a bit hesitant to use my bullet journal for everything and felt like I needed to conserve space but I’ve learned a lot this year and am excited to set up my bujo after Christmas. I’ve already started a New Bujo Planning Page in this bujo. I really wanted to think it through and have an idea of what I want. I’m also wanting to add a bit of art and more creative expression in this next one. I’ve made notes to myself on my menu about what I’m supposed to be getting done this coming week. Over this weekend I’m supposed to finish wrapping all the gifts that have arrived. Then as new ones arrive I am to wrap those right away, so that I stay finished all season and don’t let it pile up or stress me out (like it usually does ). I’m supposed to get my Christmas decorations out and up by Wednesday because I like my tree up right after Thanksgiving. Michael doesn’t like to be around when we decorate because of the mess and chaos, so I cannot do it on the weekend. So I like to put it up on Wednesday. I’m not sure if I’ll do it then or Tuesday. I’m doing most of my baking on Tuesday because THM goodies are best when they sit for at least 24 hours and I cannot do EVERYTHING on Wednesday. So there’s baking and decorating to be done too. Well, as you can see, I’ve got a busy weekend ahead of me and some shopping to finish! I hope you have a great weekend.